Standard - $26.99 Only 7 left! Want a playful costume idea that’s quick and easy for Halloween this year? Or do you have a classroom full of children eager to learn all about Dr. Seuss and his whacky characters? 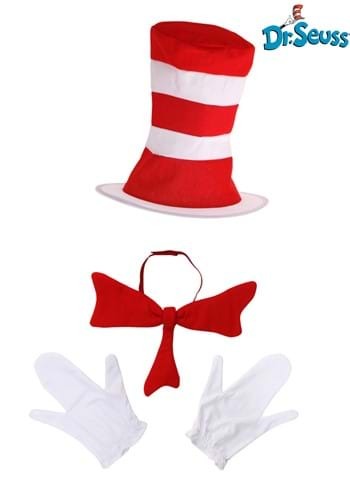 Heck, even if you’re just a huge fan, this Adult Cat in the Hat Accessory Kit will be perfect for you! This nifty bundle of accessories comes with everything needed to make a quick transformation into Seuss’s most iconic creation. You’ve got a handy pair of white gloves to cover your paws, an oversized red bow, and, of course, an extra tall red and white striped top hat. With enough charisma, you’ll easily bring this cool cat to life as well as bring a smile to everyone’s face! You can even go the extra mile and add a cute little cat nose along with some whiskers to take this outfit to the next level. Now then show everybody how to have a good time when you're dressed up as this famous instigator of fun!